WP Pro Components BALTIC DEMO test-days! HONDA CRF250R, HONDA CRF450R, KTM SXF250, HUSQVARNA FC350. WP Pro Components BALTIC DEMO test-days will be held on 9th of April on MAARDU MOTOCROSS TRACK and 10th of April on ELKŠŅU MOTOTRASE. 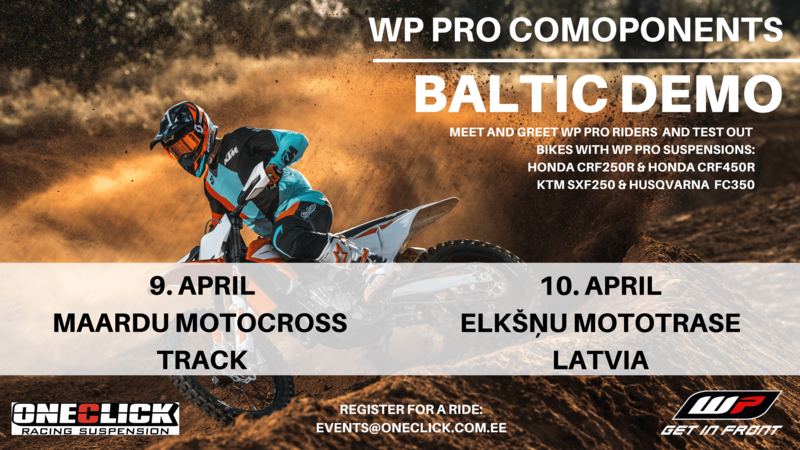 WP Scandinavia’s technicians and OneClick Suspension crew with some of Baltic’s fastest WP riders are on hand to advise or help any of your setup questions. Event starts at 15:00 to 19:00. NB: Please bring your own riding gear (incl. helmet, goggles, pants, jersey, gloves and boots)!